In its opening year in Columbus, 13th Floor Haunted House Columbus pulls out all the stops to ensure you never want to sleep again. You might want to bring a backup pair of pants. I love haunted houses, I really do, so I was beyond thrilled when we were given the opportunity to check out Columbus’ newest Halloween thrill, The 13th Floor Haunted House Columbus. Located at 2605 Northland Plaza Drive, 13th Floor Columbus has over 39,000 square feet of dark, twisted, nightmare fuel. 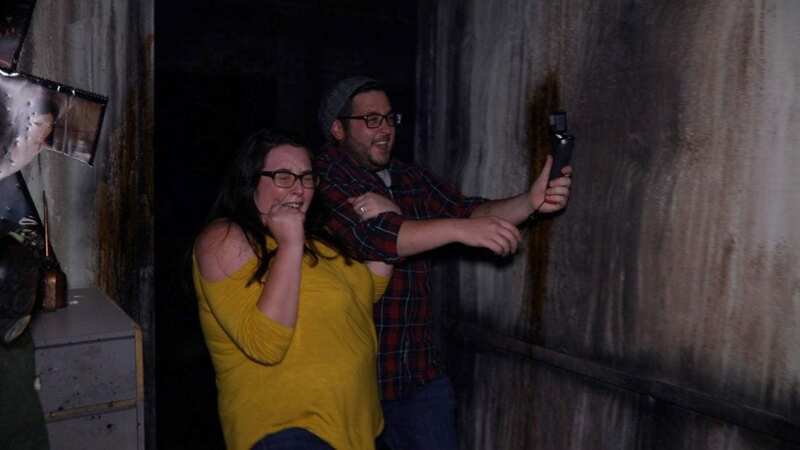 With two different attractions and several escape rooms, this place is sure to have something that will keep you up at night, or at least, sleeping with a light on for the next week. 13th Floor Columbus has two different walkthrough experiences, Darkest Dreams- a 3D neon labyrinth of nightmares comes to life, and Dead-End District- a post-apocalyptic cityscape crawling with demons, ghouls, and other things that go bump in the night. There are also several escape rooms to try, all with different levels of difficulty and unique themes. You start your tour of the 13th Floor by snapping a photo with your group. You are then given a ticket that you can use to redeem for your photo at the end of the night. After that, you are handed a pair of 3D glasses and are led into the first attraction, Darkest Dreams. I’m typically not that scared of haunted houses but there are two things that get my heart racing: clowns and chainsaws. Darkest Dreams, of course, had one of the two. Don’t let the bright colors on the handpainted walls fool you though, you will be terrified. After you make your way out of the 3D hellscape, you are ushered into the second leg of your journey around the 13th floor, the Dead-End District. The maze is lengthy and packs tons of jumps and scares around practically every corner. The elaborate sets and the inhabitants of the district really make you feel like you are in the demon-filled streets of a desolated city. With several stops around the town-there is something waiting in every corner to send your poor heart into a tachycardic rage. 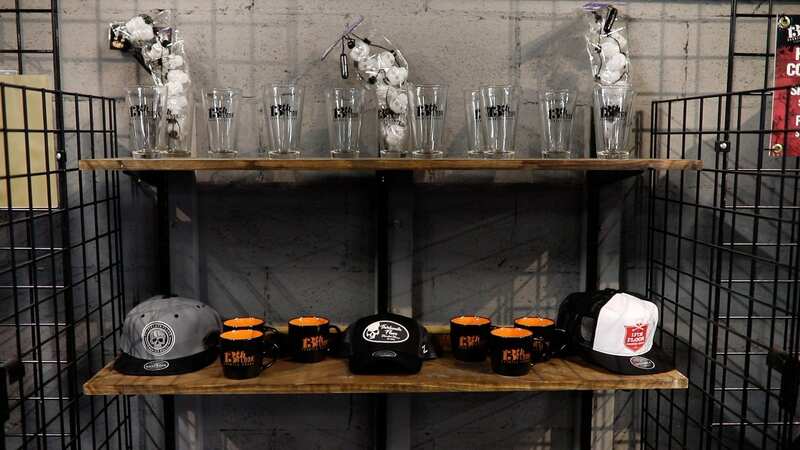 When you finally make it out, hopefully alive, you are free to catch your breath in the merch shop where you can get everything from drinking glasses to shirts to beanies. Don’t forget to check out the escape rooms right next to the exit and make sure to play a round of Zombie Brain Toss. 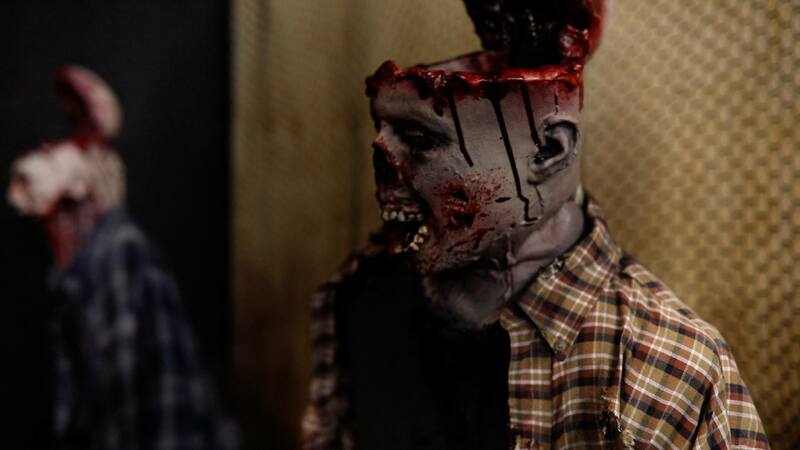 Just toss a brain into a zombie to win a prize. Make sure to grab your photo before you leave, so you have something other than haunting memories to remember from the night. I had a lot of fun at 13th Floor Haunted House Columbus, which is more than I can say for Chelsea, who made it very clear that she did not want to come with me to a haunted house. You can laugh with or at us (but really her) as we make our way through the 13th Floor below. 13th Floor Haunted House Columbus makes getting to the venue simple by partnering with Lyft. With conveniently located pick up and drop off spots, taking a Lyft is probably the best choice since there will likely be enough adrenaline pumping through you to take down an elephant, making the effort of safely driving home extra challenging. All ticket prices and hours of operation vary by night, so make sure to check out 13th Floor Haunted House Columbus‘ site for rates for specific nights. General Admission tickets range from $19.99-$34.99. For those that want to wait a little less, you can purchase a Fast Pass ticket starting at only $10 more. With the Fast Pass, you can choose from available time slots which significantly cuts your wait time. And for those with no chill, you can skip the line. Starting from $20 extra bucks you can choose a time that you and your group want to start your round of torture. Just show up and get right to the fun.